No fewer than 10 persons have been reported dead after some unidentified hoodlums raided two communities, Umuokeduru and Imeni in Ohaji/Egbema Local Government Area of Imo State. It was gathered that the armed hoodlums stormed the two communities at night when people were fast asleep. Although no group has claimed responsibility for the attack, however, residents believe that the act was carried out by some aggrieved ex-militants, who were left out in the amnesty programme of the state and Federal Governments. According to a villager, who spoke with Vanguard, “two former commanders of the militants, who are now living very big, are among the natives of the two communities attacked by the rampaging hoodlums. “The two ex-militant commanders now live like kings in choice hotels in Owerri, while their former colleagues live in abject poverty and want. The situation is more than enough to annoy anybody,” the villager said. 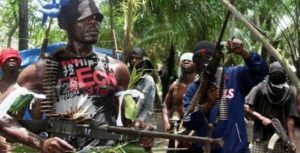 Another story that trailed the attack was that the ex-militants were very angry with the way they had been sidelined, after opting for peace and dropping their weapons. The Police Public Relations Officer, PPRO in the State, Mr. Andrew Enwerem, a Deputy Superintendent of Police, DSP, said he was yet to be briefed on the matter.